Sweet Chaos Home: All That Glitters is Champagne Bronze? However, I did finally add the all-important bathroom accessories... toilet paper and towel holders. The bathroom previously had oil-rubbed bronze accessories to match the faucets. But, I thought they'd look dull against the navy walls. I really had my heart set on something in the gold family. I began researching every conceivable option. I tend to over-think things. Polished brass was too stark and shiny, and antique brass was too dull. What I really wanted was unlacquered brass, but it was difficult to find. What I did find was not budget-friendly. 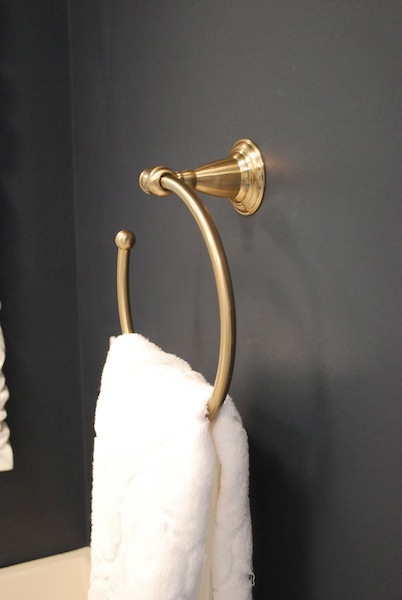 When I exhausted my online search, I went to a local showroom and told the saleswoman that I needed the look of unlacquered brass without the hefty price tag. from the Delta Victorian series. I'm sure you'll go crazy pinning this next image... ha! They have such a rich look! It's funny how much time all this kinda stuff takes to figure out! Looks awesome. Reanlly now... who does not love a bit of champagne! I like the champagne bronze...it looks so good against the navy! The time you spent looking was worth it! I can see why you had the dilemna of what metal to choose. I think you made the perfect choice! It shows up well against the dark blue and is classic, traditional and elegant looking. I have always had a "thing"
Love your masthead and all the images. Very pretty! Love that finish, it adds a dressed up finish to your bathroom..well done!! I prefer the mellow look of champagne. Your bath look great. Beautiful! Loving the bling Carolyn!~ Hope you are enjoying your summer. I love the color. It looks rich and warm. Definitely worth the wait, Carolyn. They are a perfect complement to the navy walls. Can't wait to see it totally finished. But if you're like me, that may be a while.